Before I detail the good, the bad, and rehash the very ugly about Rep. Ed Royce’s August 8, 2009 town hall, I tip my liberal hat in thanks to the Congressman for holding more than 100 town halls during his 16-year tenure. Agree with Rep. Royce or not, he listens and responds to all questions and questioners, as time permits. And he’s prepared. He does his homework. Last week, I blogged that I hoped to ask Rep. Royce “… how he plans to address the health insurance needs of his constituents if he plans to vote down Americaâ€™s Affordable Health Choices Act,” which is House health care reform legislation. While this list is pitifully short of addressing the reform needs for existing health insurance policies, and does little to address the desperate needs of uninsured residents of Royce’s district, it’s a start. The Congressman likely realizes that certain reforms are legislative fait accompli, and he wants to be seen as jumping on the bandwagon for provisions that will benefit his constituents. I hope his commitment to real health insurance reform is deeper than that. Despite firm public assurances by President Obama, Rep. Royce threatened that Democratic health care reform will cover illegal immigrants. Rep. Royce repeated the myth flatly denied by the White House that the elderly will “lose Medicare options to fund” Obama’s health care reform. At every possible chance, Rep. Royce invoked the name of Massachusetts Congressman Barney Frank, to animated groans, hisses, and head-shaking sighs. For good measure, Rep. Royce also reiterated threats of people losing and/or being taxed on their existing employer-based health care policies. And my personal favorite, Rep. Royce carefully explained to the room that “Government-Run Care Means Lower Survival Rates for Cancer.” (See Royce’s hand-out at right.) The unmistakable message: Adopt Obama’s plan, you are more likely to be fated painful death by cancer. 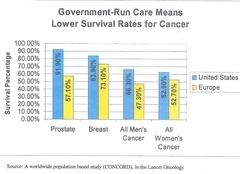 Never mind that the U.S. government wouldn’t be “running” health care delivery… Never mind understanding the assumptions, particulars, or even dates for the “worldwide population based study” vaguely cited… Never mind that most aspects of European and proposed U.S. health care systems are not comparable. The predictable result of Royce’s fear-laced mantras was frightened elderly conservatives who became more frightened, and who left armed with few solid facts, particularly about the dire consequences of not reforming rising medical costs. As I reported yesterday, political literature containing Nazi imagery linking President Obama and Adolf Hitler was openly disseminated inside the room just prior to Rep. Royce’s arrival. My suggestion for Rep. Royce is that he and his staff focus on addressing all his constituents at town halls, not only Republicans. Why try to stop the handing out of the flyer, what about First Amendment and equal access? If the flyer is rubbish then the people should be smart enough to challenge its contents as they challenge the Health Care Bills being worked on. If the flyer is truly rubbish then those that have attached their creditability will suffer. Town Hall meeting is not about one point of view. I wonder why the Orange County Register not only failed to cover the first local town hall conducted by an OC member of Congress, but also failed to cover the distribution of such hateful literature? Maybe it is because it was Royce’s town hall and they didn’t want to stir up more Republican ire after the whole Van Tran – Andy Quach mess? I am a board certified emergency physician with 30 years of experience and have seen â€œAmerica’s Emergency Safety Netâ€ gradually erode. I have personally suffered episodic ill health due to work stress and am forced at the age of 56 to consider retiring from my specialty. Many of my colleagues are burned out and want to leave the specialty of Emergency Medicine. Government has mandated we see all comers but is reducing our compensation disproportionately. Please help improve access to “real” emergency care and not increasingly overwhelm us more by your bureaucratic mismanagement. While an Emergency Medicine Resident at Harbor-UCLA in Los Angeles County in 1982 I treated an overdose patient that was inappropriately transferred from a neighboring hospital. This case became one of the sentinel cases in California that resulted in anti-dumping statutes that later led to passage of Federal EMTALA in 1986. I worked on a California/American College of Emergency Medicine Committee with Michael Jay Bresler, MD, FACEP, who is given credit for establishing several legislative amendments during his tenure on the Cal/ACEP Board. I therefore speak with some experience in helping to draft legislation to improve patient care outcomes when suffering emergencies. Having worked in an Urban ER for 7 years that serves primarily the indigent, I have seen that providing Managed-MediCal in no way guarantees access to care. Instead, it puts up more HMO barriers, and many frustrated patients have no alternative but to seek non-emergent and non-urgent advice at an Emergency Department. I am afraid that the currently proposed AAHCA of 2009 (â€œAmericaâ€™s Affordable Health Choices Act of 2009â€) will guarantee coverage but does not guarantee timely access to care. Enrollees will be forced to stand in line at increasingly overcrowded ERâ€™s. My plan would be to provide vouchers for the patients declared â€œstableâ€ by triage standard and who could be safely directed to affiliate-licensed Urgent Care Clinics for timely rapid evaluation and care. The problem is, at present, this type of referral would violate EMTALA, and ERâ€™s & Hospitals prefer the â€œbread and butter casesâ€ waiting (for as long as takes) to fill in their â€œdown-timeâ€. Ten years ago and again last year, Harbor-UCLA ER (where I did my internship and residency) performed a study that showed that 10% of the LWBS (left without being seen) patients had significant morbidity and mortality within 24-72 hours of their initial attempted visit. My plan would be to have these potential LWBS patients directed to the clinics for a timely evaluation. The Canadian Plan is indeed an excellent plan for most patients. Problem is, doctors were guaranteed a significant salary increase by the government and they did indeed get it according to several Canadian friends I have spoken with. No such plan seems to be feasible in the United States where there are no longer available financial resources short of increasing taxation. Instead, the present plan seems to further guarantee reduced reimbursement to US physicians. This will not engender acceptance and may jeopardize real health care reform in the Unites States. I DO believe there should be a National Health Care Plan.